MPPSC SET 2019 Result Check Here. MPPSC SET 2019 Marks Check Here. Download Admit Card Link will Activate Today Clik Here. MPPSC SET 2018 Exam Schedule Check Here. MPPSC SET Notification is out. 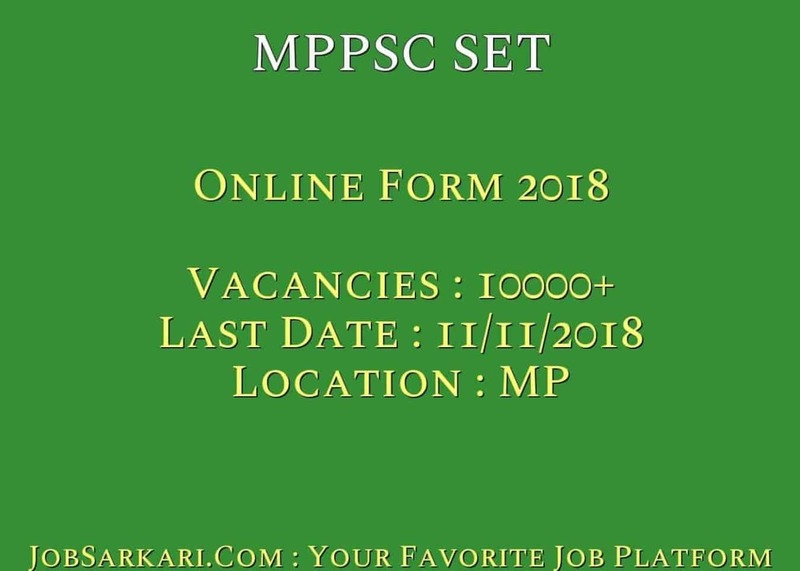 MPPSC SET is recruiting for 10000+ Online Form 2019 Posts. You can check MPPSC SET - Madhya Pradesh Public Service Commission last date, download MPPSC SET notification, visit MPPSC SET official website and check other MPPSC SET Vacancy details.Complete Vacancy and recruitment Details about 10000+ Online Form 2019 vacancies in MPPSC SET are provided below by JobSarkari.Com only for you. Last Date for Apply Online 11/11/2018. Last Date for Receipt of Hard Copy of Application Form 29/11/2018. SC / ST / PH / OBC Rs.600/-. Candidate Must Have Passed Master Degree in Related Subject With 55% Marks (50% for SC / ST / OBC). First Paper (General Awareness & Teaching and Research Aptitude ) 100. 50 Question. 01 Hours(60 Minutes). Second Paper (Selected Subject) 200. 100 Question. 02 Hours(120 Minutes). 1. The Candidates can Apply through Online / Offline Mode. 4.Fill All the Mandatory Details in the Application form and read All the instruction Before filling the Form. 5. Upload the Scanned Copy of Documents in Prescribed Size and Format as Mention in the Application form. 7. Online Application Can be Submitted on or Before 11th November 2018. 8.Candidate Need to Send the Hard Copy of Application Form to the Address Given Below. Exam Controller (SET), State Eligibility Test Board, Madhya Pradesh Public Service Commission, Residency Area, Indore - 452001. On or Before 29th November 2018. Q. What is the Last Date For MPPSC SET Online Form 2019 Vacancy ? A. 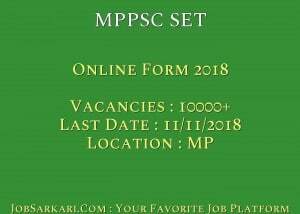 Last Date for MPPSC SET Online Form 2019 Posts is 11/11/2018. Q. What is the Form Type of MPPSC SET Online Form 2019 Recruitment ? A. The Form Type for MPPSC SET Online Form 2019 Posts is Offline, Online. Q. How many vacancies are available in Madhya Pradesh Public Service Commission Online Form 2019 Posts ? A. There are about 10000+ Vacancies in Madhya Pradesh Public Service Commission Online Form 2019 Posts. Q. What is the Full Form of MPPSC SET ? A. Full Form of MPPSC SET is Madhya Pradesh Public Service Commission .